Cassandre is clearly one of the giants of poster design. Born in the Ukraine to French parents in 1901, Adolphe Jean-Marie Mouron moved to Paris as a young man where he studied at the École des Beaux-Arts. Influenced by the Cubist and Surreal movements, and adopting the pseudonym, AM Cassandre, he developed a style that remains as vibrant and exciting today as it was when first created. Cassandre was truly a gifted artisan. In addition to posters, he created several typefaces and excelled at graphic design. The famous Yves St-Laurent logo was a creation of Cassandre. But it is his posters that are his legacy. Beautiful is not a word that comes to mind when describing his work. Stunning, evocative, inspiring are more apropos. His interest in cubism is often evident in his work. He understood that posters were not works of art created for one individual but rather works of art for public display in thousands of locations. It was art for the masses designed to serve a function, that being advertising a product or service. 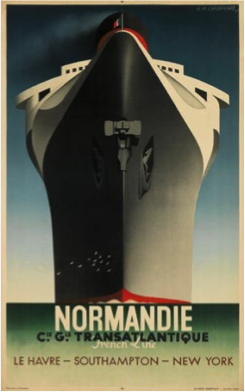 Normandie, designed for the French Line, is one of his most famous posters and captures the size and beauty of that great ship from a unique angle; while Wagon-Lits (the company who provided sleeping cars to the French railroads) portrays an image of night on a train, through a deep blue ski, pierced by a red signal light. Cycles Brillant emphasizes the racing nature of these bicycles by tilting the rider and bike like on a velodrome. 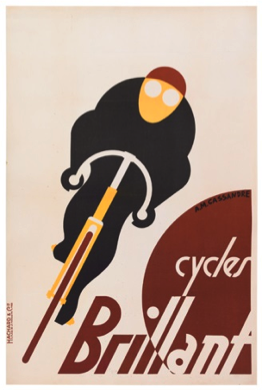 Cassandre posters are prized by collectors and command high prices. 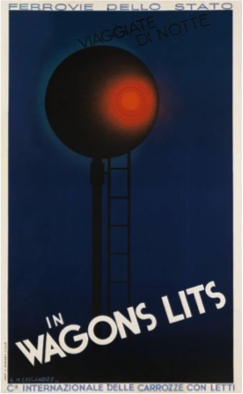 It’s rare that a Cassandre poster comes to market for less than several thousand dollars and five figure prices are common.